Androgen receptor (AR) and AR signaling pathways are thought to play a role in breast cancer (BC) and are potentially related to treatment responses and outcomes. Ankyrin 3 (ANK3) is associated with AR stability in cancer cells. In the present study, we investigated the clinicopathological utility of ANK3 expression with emphasis on AR and its associated signalling pathway at transcriptomic and proteomic phases. The Molecular Taxonomy of Breast Cancer International Consortium (METABRIC) cohort (n = 1980) and The Cancer Genome Atlas (TCGA) dataset (n = 1039) were used to assess the expression and significance of ANK3 mRNA and other AR signalling pathway-associated gene signature. 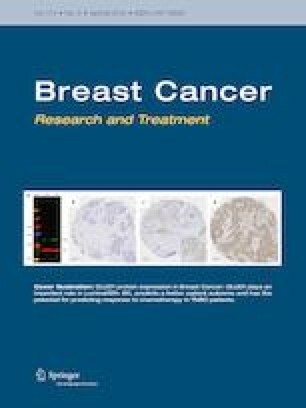 Using immunohistochemistry, ANK3 protein expression was evaluated in large (n = 982) cohort of early-stage BC with long-term follow-up and compared with clinicopathological characteristics and its prognostic value in the whole cohort and the subgroups stratified by AR protein expression. An AR-related gene signature was developed, comprising 20 genes, which included ANK3. This AR-related gene signature was significantly associated with AR mRNA expression, oestrogen receptor, human epidermal growth factor receptor 2 (HER2) status and the patients’ outcomes. In tumours with high AR protein expression (n = 614), high ANK3 protein expression was significantly associated with progesterone receptor positivity and it was independently associated with the good outcomes (p = 0.025). This study indicates that ANK3 is related to AR signalling pathway and is associated with BC prognosis. The online version of this article ( https://doi.org/10.1007/s10549-019-05216-w) contains supplementary material, which is available to authorized users. We thank the Nottingham Health Science Biobank and Breast Cancer Now Tissue Bank for the provision of tissue samples. This study was funded by the University of Nottingham (Nottingham Life Cycle 6). Ibraheem Alshankyty is a consultant/advisory board in Molecular Diagnostics Lab, College of Applied Med. Sci., KAU. All authors of this work declare that they have no conflict of interest. This study was approved by the Nottingham Research Ethics Committee 2 (Reference title: Development of a molecular genetic classification of breast cancer). All procedures performed in studies involving human participants were in accordance with the ethical standards of the institutional and/or national research committee and with the 1964 Helsinki Declaration and its later amendments or comparable ethical standards. Informed consent was obtained from the participants included in the study.